On February 1st, 2019, His Holiness Patriarch Mor Ignatius Aphrem II attended the Holy Qurobo celebrated by His Beatitude Joseph Absi, Greek-Melkite Catholic Patriarch of Antioch and all the East, Alexandria, and Jerusalem, at the Lady of Dormition Cathedral in Bab Sharqi, Damascus. During the Qurobo, His Beatitude ordained the Very Rev. Archimandrite Elias Al-Dabieh as Archbishop of Basra, Hauran and Jabal Al-Arab for the Greek Catholic Church. 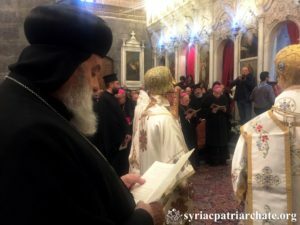 His Holiness was accompanied by His Eminence Mor Timotheos Matta Al-Khoury, Patriarchal Vicar in the Patriarchal Archdiocese of Damascus, and Very Rev. Raban Joseph Bali, Patriarchal Secretary and Media Office Director. 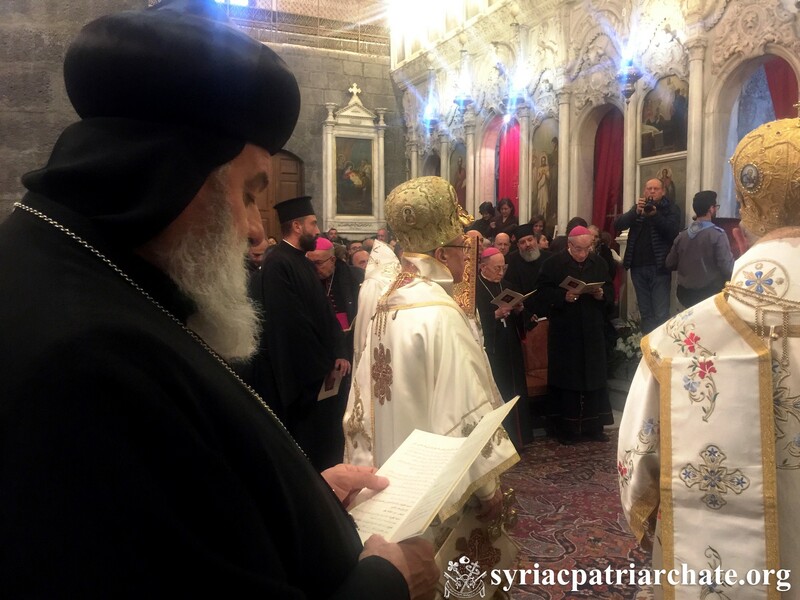 His Eminence Mario Cardinal Zenari, the Apostolic Nuncio in Damascus, as well as Archbishops and representatives of the various Churches in Damascus, attended the ordination. At the end of the Qurobo, His Holiness congratulated His Beatitude Absi and His Excellency Al-Dabieh for the ordination, and wished the new archbishop a fruitful service for the glory of God and the growth of His Holy Church.